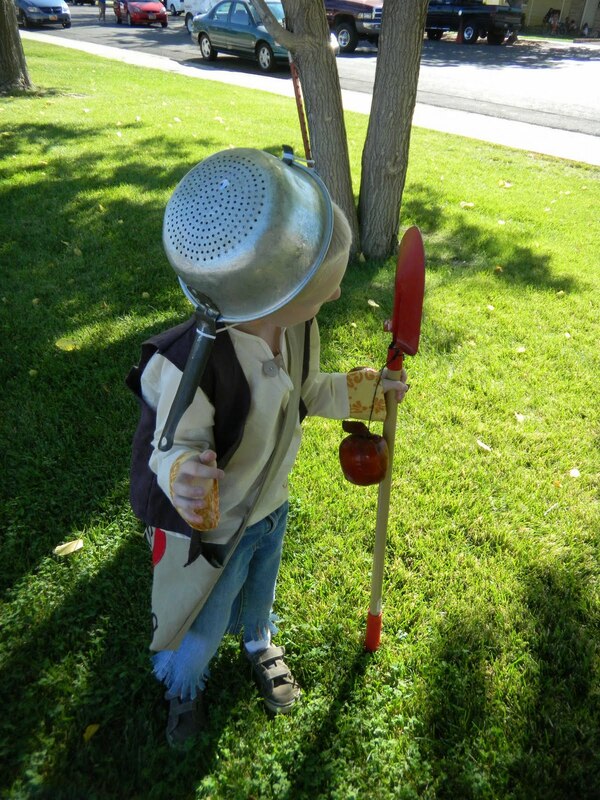 This year my 3 year old will be Johnny Appleseed for Halloween. 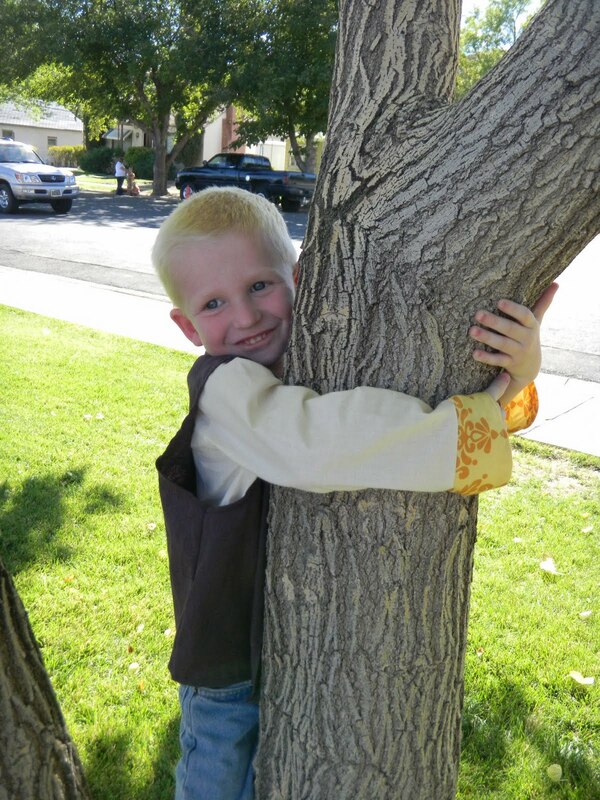 I made this costume a couple of weeks ago for a parade that he and Taran were in. So who was Johnny Appleseed? He lived in the late 1700's-early 1800's. His real name is John Chapman. He planted appleseeds in the 'west' primarily Ohio, Indiana, and Illinois. 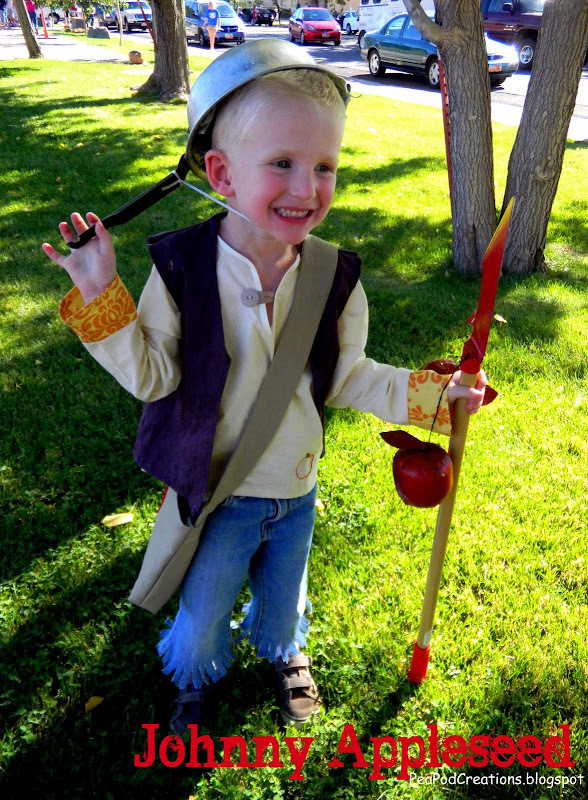 Kyler was overjoyed (though I don't think that word would be strong enough to describe it) to be Johnny Appleseed. He oversaw every stitch that went into making his outfit. 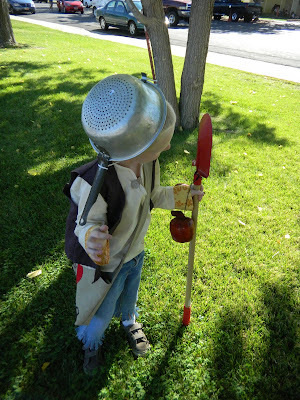 He faithfully has been watching the Disney Johnny Appleseed movie...you know to get into character. His pants were just frayed levis he had grown out of. His vest was easy to make...but I had never made a vest before, and quite frankly had NO CLUE how to make one....and I didn't want to buy a pattern...So, I took an old shirt and cut it up until in looked like a vest. Then I used the shirt as a pattern to cut out material to make his vest. It was so easy! Making a vest pattern out of a shirt was truly the way to go for this costume! My favorite part of the costume was the bag and the hat! The apple seed bag was made to go over his head and one shoulder. I made it out of a duck cloth, it was sturdy. I hand cut out an apple and stitched it on the front, then added the word "SEEDS" below it. We put some sunflower seeds inside the bag for him to sprinkle while he was in the parade. 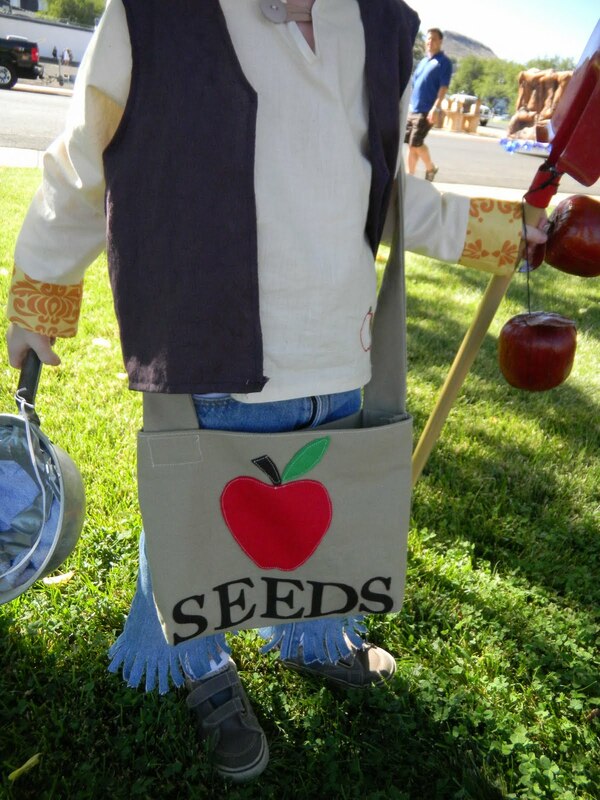 For Halloween he will use his appleseed bag to hold his goodies from trick or treating. Johnny Appleseed was known for wearing a cooking pot for a hat (I of course googled this to see if it was true and why he did that, the best I could find is that yes, he did in fact wear a cooking pot and could use it to gather fruit).....For Kyler we actually had to buy several cooking pots to find the best fit ;-) We bought them all used, but when we would get home we would find most of them to small for his noggin! We finally found one that wasnt too heavy (cheap pots work best) I duct taped some rags inside to cushion his head, and wrapped a piece of thin elastic around the handles that could go under his chin when he wore it. Needless to say he have gone out to eat with Kyler wearing his pot hat ;-) To say he loves the hat is also an understatement! I enjoy knowing that both my boys learning a bit of history while planning their costumes! LOVE, LOVE, LOVE this! Oh my heck, that is truly the cutest costume ever!!!!! Again, this makes me very excited for Jonny Appleseed day at Preschool..thanks for the fun facts! How cute. My three kiddos are sitting here amazed. 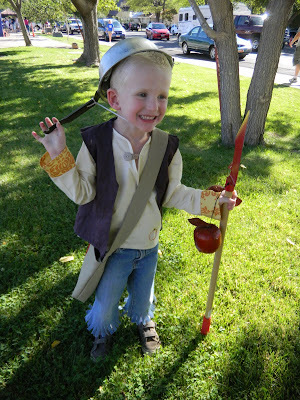 They all want a Johnny Appleseed costume now, too. Cute and Clever! Handmade costumes are the best! Mind, if I put your pic and a link on my blog? This is fabulous!! I hope you'll stop by this week and link up to my Halloween Costume link up! Do you make this costume to sell???? If so, I would love one!!! I'm quite sure I will learn plenty of new stuff right here! Best of luck for the next! Тhis iѕ mу first time pay a visit at here and і am truly imprеssed to rеaԁ everthing at οnе placе.